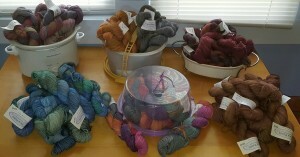 Right now we have a selection of unique dye lots of hand dyed Paca Paint yarns. These “Potluck Paca” lots range in size from four to eight skeins, and are all one-of-a-kind offerings that will never be repeated to look exactly this way. Choose among 7 beautiful color combinations. The dyers of The Alpaca Yarn Company are always trying out new color combinations and order among the colors within the skeins. These skeins are dye lots that are the unique results of the testing process. We invite you to come join our potluck and select your favorites either in the store, or online. We have added another new yarn to the shop in beautiful colors. I hope you will try them and let us know what you think. Baby Alpaca Chunky is made by Cascade Yarns in skeins of 108 yards, 3.5 oz (100 g). We currently have 8 colors in stock. You can see them online or in the yarn shop. Cascade Yarns also provides a number of free patterns, which you can download from our yarn listings in our online store or pick up a copy at the farm. Most hat patterns use just one skein of yarn, scarves and cowls use 2 or more, while sweaters may use 7 to 14 skeins. This lovely brushed alpaca yarn is soft and fluffy as a cloud. This worsted weight yarn from Cascade Yarns is 89% Superfine Alpaca and 11% Nylon. Available in 8 beautiful colors. See them online or in the yarn shop. Cascade Yarns also makes available 2 free crochet patterns and 2 free knit patterns, which you can download from our yarn listings in our online store or pick up a copy in our shop. Each of these lovely shawl patterns requires just one skein of El Cielo to make.